Racecar. A man, a plan a canal: Panama. Eve. Each of these is a palindrome, spelled the same way forwards and backwards. Ever since the day I figured out my name was a palindrome, I have been on the lookout for others. I even convinced my parents to name my sister Hannah with an extra “h” (originally it was Hanna) so we could both be palindromes. Palindromes are uncommon, once you move past the ordinary ones like “mom” and “dad.” Interestingly though, both of those words are actually palindromes in Hebrew too. 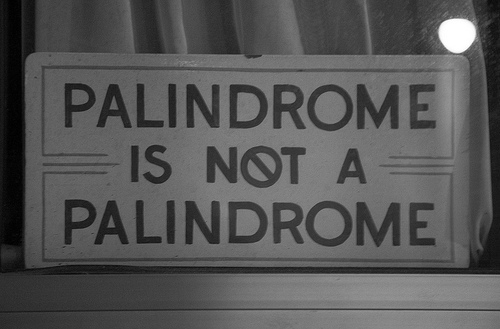 When I discover palindromes and other linguistic oddities, I find myself looking for added meaning, which is why this week’s parshah brings out my inner geek. Parshat Ki Tissa begins in chapter 30, verses 12-14, “When you take a census of the Israelite people according to their enrollment, they should give the Lord a ransom for himself on being enrolled, that no plague may come upon them through their being enrolled. This is what everyone who is entered into the records shall pay: a half-shekel by the sanctuary weight.” Two words in these verses jump out. The word for “they shall give” is ונתנו (v’natnu). If you look at the Hebrew letters vav, nun, taf, nun, vav, you will see that it is a palindrome. The Torah teaches that giving is a cycle. Here, we give to show our membership to the community and show our membership to this group of people. But the rabbis teach that the reason this word is palindromic is because we should be giving as we might receive. Being a part of the community means that throughout all of life’s ups and downs, we will be supporting others as we ourselves are supported. The second word that brings layers of meaning with it is “Half a shekel,” מחצית (mechatzit). While this word is not a palindrome, it does carry a significant teaching. The first letter and last letter,mem and taf, combine to spell the word met, which means death. The second and penultimate letters combine to spell chai, which means life. The middle letter, tzadi, is the first letter of the Hebrew word tzedakah which, in one sense, has come to mean giving charity. In this text a half shekel literally meant the difference between life and death for those who were counted in the census for the military. Today, we read these words and understand that the way we give and the way we receive can be the difference between life and death to some in our community. Parshat Ki Tissa holds in it a pivotal moment in our narrative. The text reminds us of the incident of the golden, masked calf, where the Israelites lost faith and created an image to worship. Their fear and lack of faith angers and frustrates God. God wants to destroy the nation, and Moshe has to step in and intervene. This is a Moshe who has now accepted the responsibility of protecting the people. There is a give and take when we each take responsibility for one another, and this is a theme found throughout the parshah. The first four psukim of Ki Tissa teach us this deep lesson in a profound way. THIS TOO IS TORAH: We still have a census taken periodically today. What do you think is different about the kind of census taken in the time of the Torah and the kind taken today? What question do you think should be asked as part of the Dallas Jewish Community census? I’ll leave you with this palindrome question to ponder: Are we not drawn onward, we few, drawn onward to new era?